In this class project, we explored different software and and representation techniques, by designing a medicine reminder and it's companion app. The software is meant to connect an aging family member with a caregiver (often their children) and keep the caregiver informed as to wether the patient is taking their medicine correctly. 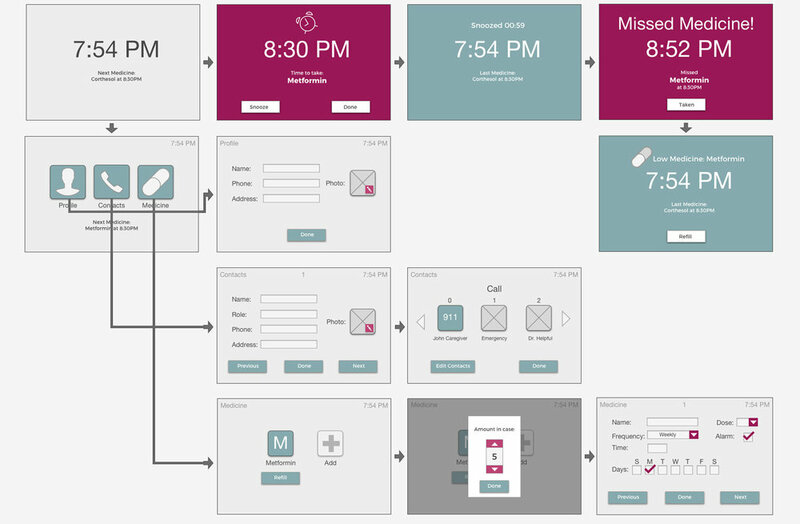 I made wireframes for the app, which is meant to be used by the caregiver. I like to start with paper and a pencil. I like drawing on paper because I won't worry about exact looks, alignment, and I can easily throw it aside and start over. Once I have an idea of what the main screens will look like, I opened Balsamiq. Busy middle aged professionals (30s-50s) with aging parents and their own families. This feedback would have been extremely useful in further prototypes, allowing me to take the app in a more informed direction moving forward. This second part was not necessarily designed to be for the same device, but definitely meant for a similar system. This is the interface of the medicine holder that is connected to an app. The medicine holder is used by the elderly parent, and should be easy to use by patients that are not familiar with technology. Designed are the first time user setup of the device, as well as the main screens of the interface. This software allowed me to explore animation design and the flow and transitions between different screens and menus. It was also a good opportunity to discover the importance of movement in design, and the animation of assets between screens.